Hemel Town top-scorer Jamie Slabber has joined National league South rivals Sutton United on loan until the end of the season – with Tudors boss Dean Brennan admitting that he has now given up hopes of reaching the playoffs. Slabber has 12 league goals to his name this season, seven more than second-highest scorer James Potton, having been forced to shoulder the majority of Hemel’s goalscoring duties following the departure of Oliver Hawkins to Dagenham & Redbridge in January. The decision to let Slabber go was made following Saturday’s draw against Bath, which effectively ended Hemel’s hopes of making the top-five this season. 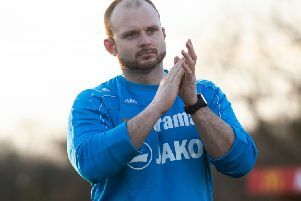 Explaining the move, Hemel manager Brennan said: “Slabber has gone on loan to Sutton – It was an agreement I had with them because they gave us Louis John earlier in the season. “I stick to my word, and I told them that if I felt that we couldn’t get into the playoffs, I would give them Jamie Slabber. And that’s what has happened. Speaking to the club’s official website, Sutton boss Paul Doswell said: “We enquired immediately after Craig McAllister’s injury at Chelmsford, but Dean Brennan was clear he wanted to keep him. “I spoke to Dean again after our match recently, and he said he would consider our approach and speak to Jamie. “I am grateful to Dean for allowing this important loan move to happen, and it shows the good relationship between the clubs, which includes us helping Hemel with Louis John’s loan to them. “Once Jamie was aware of our interest, he was extremely keen to return as it was only a change of job that led to him leaving us when he did to sign for Bromley. “Thankfully he’s now able to train Tuesday and Thursday daytimes, as he’s now self-employed. “Jamie has already scored 14 league goals this season, and has scored in Hemel Hempstead’s cup games as well, and his predatory instincts in the box are vital in tight and important games. “He’s a different type of forward to Dan and Craig, but would complement either if paired together. “With the exception of signing a goalkeeper should Ross get injured, this is the final piece of the jigsaw to give us plenty of depth to the squad for a very challenging run in, which includes the Surrey Senior Cup and potentially three play-off games.